Travel to Kensington (Olympia) station on London Overground. It is one stop from Shepherd's Bush (Central Line) or West Brompton (District Line). Kensington Olympia station provides direct services to Clapham Junction, Gatwick Airport, Brighton, Watford Junction, Willesden Junction. The station is next to the venue. 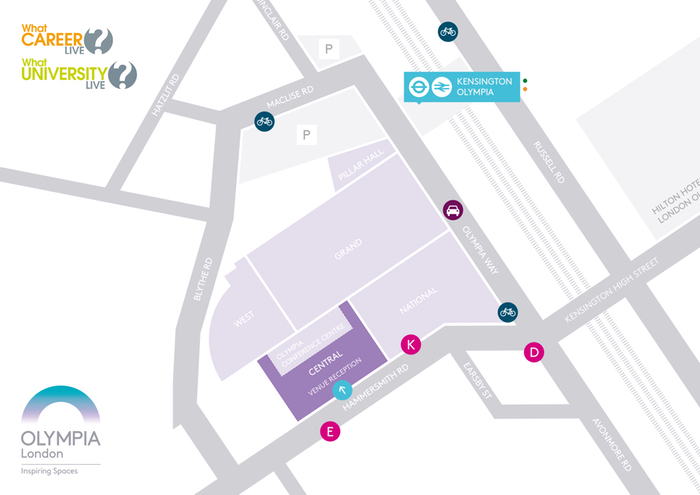 Direct access to Olympia London from all London airports via tube and rail networks. Groups with a minimum of 40 visitors travelling to Olympia, London from outside Zone 6*, are eligible (subject to availability) to receive £200 towards travel costs. - Groups attending must be travelling from the regions outside Zone 6* on the London Underground network. - A group of 40 or more needs to be registered and attend What Career Live? and What University Live? on either the 11 or 12 October at Olympia, London. This can include students, advisors (teachers, lecturers or other) and accompanying adults. The transport subsidy will be paid based on the number that attend (i.e. if 40 people are registered for the event and 33 attend; no subsidy will be paid). * Zone 6 is defined by the Transport for London's zonal fare system, so school groups travelling from areas that are based in Zones 1 - 6 of the Transport for London system will not qualify for a transport subsidy. Don't forget to bring your ticket with your for fast-track entry.